It’s that time of year again: Hanukkah! The festival of lights celebrates yet another historical victory of our people over an oppressive regime. To that end, we light our menorahs, spin our dreidels and exchange those gold-wrapped chocolate coins. Of course in America we also really, really like Christmas, from the beautifully decorated Christmas tree to the colorfully lit streets. We also envy the gifts. Hanukkah is not traditionally a gift-giving holiday, but we just can’t resist the craze. Still, if you are going to give a gift, why not give something Hanukkah-style, and not just another Christmas gift? Click photo to download. Caption: A menorah for the patriotic. Credit: Gallery Judaica. Forget the traditional menorah and go for a laugh with a themed piece. Yes, believe it or not, menorahs can actually come in the shape of a soccer goal, a minivan, a bicycle, a castle or a train. Maybe your little nephew will prefer a menorah in the shape of a dog, a cat or some other unidentifiable monster. Have your loved-one project both his Jewishness and inner patriotism with Statue of Liberty-shaped candleholders. Check out traditionsjewishgifts.com, Galleryjudaica.com or Menorah.com. No doubt you’ll be able to find whatever suits your particular, or perhaps wacky, taste. Note that you can also find similarly unique dreidels, which you can custom design. How about a Disney-themed menorah with Mickey Mouse as the Shamash? Did the oil in the little vase truly suffice to light the menorah for eight days? Whether you believe this or not, Hanukkah is at least rooted in history. Why not reinforce this lovely story of our people with a book? With colorful pages, Festival of Lights: The Story of Hanukkah by Maida Silverman is wonderful for retelling the story of Hanukkah with your friends and family. For the slightly older crowd, 500 Questions and Answers on Hanukkah by Jeffrey Cohen will do. Then again, you could also go with Hershel and the Hanukkah Goblins by Eric Kimmel. Your kids will go haywire for Hershel of Ostropol as he uses a dreidel, pickles, eggs and charm to outwit some hill-dwelling hobgoblins who forbid the town from celebrating Hanukkah. All of these books are available on Amazon.com. Click photo to download. Caption: Make sufganiyot together as a creative holiday gift. Credit: Yoninah. 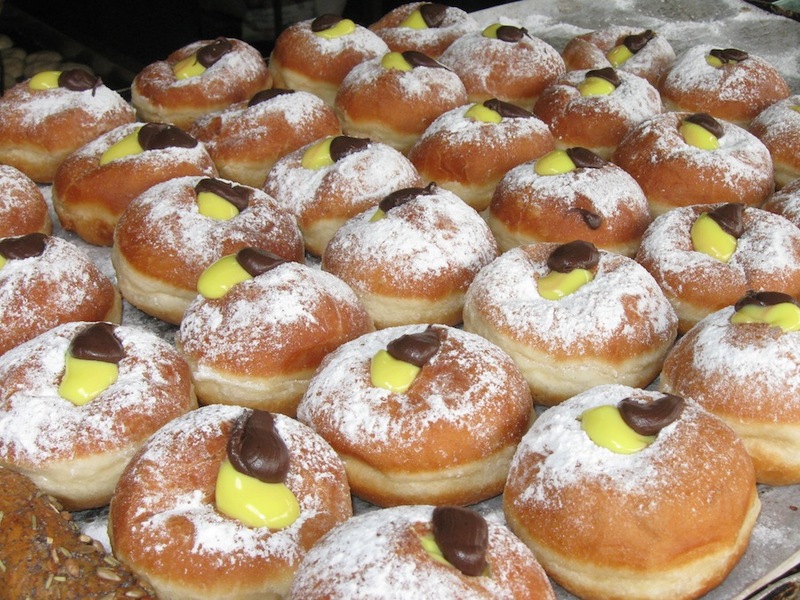 Dunkin Donuts has nothing on Israeli-style sufganiyot, a typical Hanukkah dish. Just think of that mouth-watering jam inside that soft, sugar-coated dough. This year, why not try to bake a few sufganiyot yourself? Share the sweet result of your labor of love with family and friends. Or, better yet, turn it into a fun family activity for one of the eight nights. Check out Chabad.org or Marthastewart.org for recipes. For those tech-lovers in your life, the typical gadgets would probably suffice for them to squeal with excitement. Yes there’s the latest Kindle, video game console, iPad or digital video camera, wireless headphones, Bluetooth earpiece and the like. Of course, if you really want to emphasize the Hanukkah connection, how about a Hanukkah-themed iPhone cover or digital menorah? Check out Zazzle.com. There are also neat Hanukkah iPhone apps such as Dreidel HD, which allows you to spin a virtual dreidel with a tap. Depending on how it falls, you win a certain amount of chocolate coins. Get it from iTunes.com. There’s got to be a geek in your life who will dig that. Let’s face it: spinning the dreidel over and over again eventually gets boring, or causes your hand to hurt. But modern culture has fortunately given us entertainment that our forefathers in their small, Jewish villages could never dream of. Don’t just spin the dreidel, spin it as part of the “Maccabees Board Game” to move your piece around and collect oil lamps! For young kids, the “Rite-Lite Judaica '101 Things To Do for Hanukkah' Creative Fun Activity Set” includes stickers for coloring, Hanukkah puzzles, activity books, dreidels, crayons, glitter and many other goodies to keep your munchkins busy (so you can rest). All these can be found on Amazon.com. Maybe you’re really not into Hanukkah gifts. Maybe you’re one of those people who think gifts are for Christmas, and Hanukkah is NOT Christmas. Maybe you think society is just way too materialistic. You can still find another way to make someone happy this Hanukkah. Keep the typical Hanukkah money (or gelt) tradition alive by donating to a charity or organization of your choice. Don’t be a “Hanukkah Scrooge”! Posted on December 13, 2011 by Alina D. Sharon/JNS.org and filed under Hanukkah, Special Sections and tagged gift gift guide holiday.